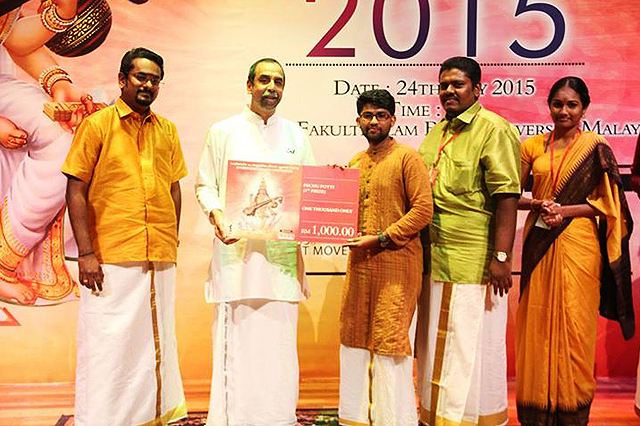 UTAR Faculty of Arts and Social Science second-year Journalism student Sivaraj a/l Lingaraj emerged as champion of the Intervarsity Bhajan Competition held at the Faculty of Built Environment, University of Malaya on 24 May 2015. Sivaraj was presented with RM1,000 cash and a certificate of achievement for his topic on ‘Scientific Terminology of Sivapuranam - A Spiritual Hindu Poem’. Organised by the 1Malaysia Indian Student Movement, the competition aimed to promote and instill morality, positive values, discipline and unity among the young Indian generation especially the university students. The competition also aimed to promote public speaking skills in the Tamil language. Fifteen contestants from seventeen universities and colleges across Peninsular Malaysia participated in the competition. Each contestant must deliver a five to seven minute impromptu speech on a topic given by the organiser. Contestants were evaluated on their ability to speak well and present their thoughts clearly and effectively relating to the topic given. “Participating in this competition was an enriching experience. It was challenging because most of the contestants were really articulate and well-trained. I did not expect to win the competition and it came as a surprise to me. It was very exciting and we had to think very fast to speak impromptu upon receiving the topic,” enthused Sivaraj, who had so far won 12 winning titles in public speaking. “I would like to thank my parents, lecturers and friends who gave me much encouragement and to UTAR for giving me this opportunity to represent the university in the competition,” said Sivaraj, adding that he had learnt much from this competition. The guest of honour who gave out the prizes was a lecturer of Universiti Pendidikan Sultan Idris, Prof Datuk Dr Rajendran Nagappan. Also present at the prize giving ceremony were Director of 1Malaysia Indian Student Movement, Mahaganapathy Dass; Director of Intervarsity Bhajan Competition, Umasudhan; and President of Hindu Association of University of Malaya, Livanyah Priya Manimaran.